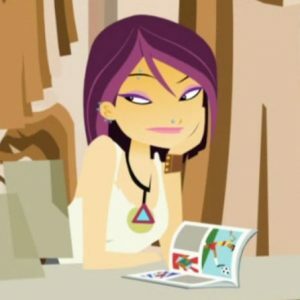 This week’s entry is Nikki Wong, the acerbic-but-funny character from “6Teen.” “6Teen” is a Canadian animated series about a group of teenage friends and their misadventures at a Mall of America-like gigantic shopping mall, apparently located somewhere in Ontario. Nikki is portrayed as the most cynical member of the group. She’s often prone to making sarcastic comments, or being level-headed as the situation demands. Despite the cynicism, however, Nikki does care for her friends, including her polar opposite, Caitlin (a pink-wearing, shopping-obsessed girl). Nikki is also shown dating a few people over the run of the series, particularly an off-and-on relationship with fellow lead character Jonesy. One of the running themes of the series is Nikki’s dislike of conformity. This contrasts with her place of work at the mall, the “Khaki Barn,” a store similar to Eddie Bauer or American Eagle. At the Khaki Barn, Nikki’s coworkers are all perpetually-perky “clones” (as Nikki nicknames them), and the clothes are all highly conformist. Granted, Nikki doesn’t seem to put much effort into her job in the first place. She’s often seen sleeping on the job, making sarcastic remarks about the clothes to customers, etc. Nikki’s only reason for taking the job, as given in the first episode, is to save up money for traveling someday. It was also pretty much the only job available. Nikki’s parents are occasionally shown in the series. Unlike their daughter, they seem somewhat conservative. They’re also usually shown wearing dated 70s-era clothing. (Nikki’s mother looks to me for some reason like Marlo Thomas from 60s series “That Girl.”) Her parents play a big role in the series finale. Nikki’s father accepts a job in the sparsely-populated Canadian province of Nunavut, forcing Nikki to move away. Some of Nikki’s most amusing lines were in the first Christmas episode, “Deck the Mall,” which I’ve previously written about. Nikki’s voice actress is Stacey DePass. Unlike the rest of the main “6Teen” cast, Nikki’s apparently kept her original full name in the (Quebec) French dubbed version of the series.